India’s main opposition party, the Bharatiya Janata Party (BJP), suffered a humiliating defeat during the recent parliamentary debate on Foreign Direct Investment (FDI) in the retail sector. Most notably, the party failed to enact its strategy of isolating and embarrassing the ruling United Progressive Alliance (UPA) government in both houses of parliament. Thinking that it could exploit the weaker support for the Congress Party among its UPA coalition partners, the BJP forced the government to vote on a contentious FDI initiative led by the ruling coalition. The whole idea to undermine the Congress-led UPA government in both the Lower and Upper House failed, however, as parties outside the coalition came to its rescue when it came time to vote. Much to the BJP’s chagrin, the government initiative was easily approved. It is still not clear how much the nation benefitted from the debate on FDI. What is apparent is that the vote has improved the standing of the Congress Party and its UPA coalition government. If the idea was to isolate the ruling party in parliament, then the BJP made a serious miscalculation. 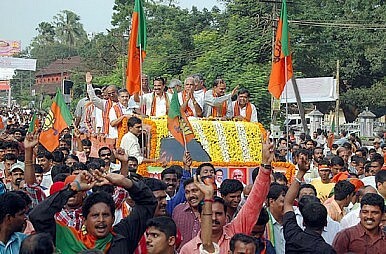 In fact, it was the Hindu nationalist party that was embarrassed by the vote. After all, it was the BJP that first proposed allowing FDI in the retail sector when it was in power in 2004. Thus, a party that once championed the cause of economic liberalization and free market economics is suddenly sounding Leftist in its partisan bid to secure a strategic victory over the UPA ruling government. It should be noted that the BJP’s more protectionist proclivities at the national level is clearly the result of political jockeying than any real change in its policy orientation. This is evident from, among other things, the fact that the party still champions economic liberalization policies in state governments that it controls. For instance, the BJP-government in Gujarat is actively seeking foreign investment with people like Chief Minister Narendra Modi travelling to different parts of the world to promote the state as an ideal destination for investment. Interestingly, Modi is the most popular leader of the BJP and is widely expected to be the BJP’s prime ministerial candidate in the upcoming 2014 elections. As Indian Express Editor-in-Chief Shekhar Gupta notes, the BJP’s blunder over FDI in retail is not an isolated incident. Repeatedly since losing control of the central government in 2004, the BJP has demonstrated that it refuses to accept this loss and continues to act as though the UPA government is about to collapse. Consequently, the opposition party has failed to build an effective five-year opposition plan, and instead only developed strategies for each session of parliament. This has allowed the scandal-ridden UPA government to retain an image of strength and confidence. Instead of playing the role of a constructive opposition, the rightist BJP has been obstructing parliament even on issues of little importance. This has allowed the UPA to portray the BJP as the culprits behind the country’s problems. The wisdom of this strategy was confirmed by the 2009 general elections in which BJP suffered one of its worst political debacles in recent memory, including losing over 20 seats in the lower house of parliament. The BJP’s opposition tactics are believed to have hurt its appeal with some of its core constituencies, such as the middle class and urban voters. Among other things, analysts point to the BJP’s opposition to the Indo-U.S. nuclear deal that had broad support among India’s middle class. Some believe that the BJP is repeating its mistake by opposing FDI. The BJP faces an identity crisis – whom does it seek to represent and what vision or principles does it stand for? At this point, the answers to these critical questions remain elusive. From dedicating anthems to new welfare measures, the Congress Party is wooing this politically important bloc.